I always knew my mother loved me, but it took becoming a mother myself to understand the completely boundless unconditional love that she has for me and my siblings. I can never adequately express the newly found appreciation that I have for my mother. We've always been close, she's always been my rock. It's more that I now realize she wasn't just the rock... she was the rock, the air, the water, the everything. Whatever I needed, she was. I love you mom. Thank you. Thank you to my daughter. You are the most amazing little girl and I can't imagine my life without you. Without you I would not be mommy and there is no one else I'd rather be. Happy mother's day to all the amazing women in my life... my mother, my Grandma, my Amma, my sister, my aunts, my cousins, my in-law's, my friends. 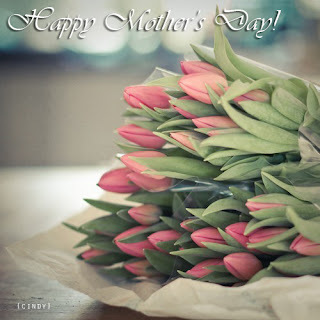 Happy mother's day to you my dear friends, I hope you have a wonderful day with those you love.